The annual SAS Championship golf tournament benefits the YMCA’s Y Learning tutoring program for kids. In addition to the main tournament, events include the PNC Family Challenge Clinic for parents and children. While the SAS Championship has changed over the years, one thing has not: The annual golf tournament always gives back to the community. Tournament Director Jeffrey Kleiber said the first few years’ proceeds went to the nonprofit Communities in Schools, which supports at-risk students. Now all of the money goes to the YMCA, earmarked for the Y Learning tutoring program. Started in 2010, Y Learning works to bridge the gap between low-income students and academic benchmarks. Since its start, Y Learning has helped more than 7,800 kindergarten through eighth-grade students keep up with their school work. 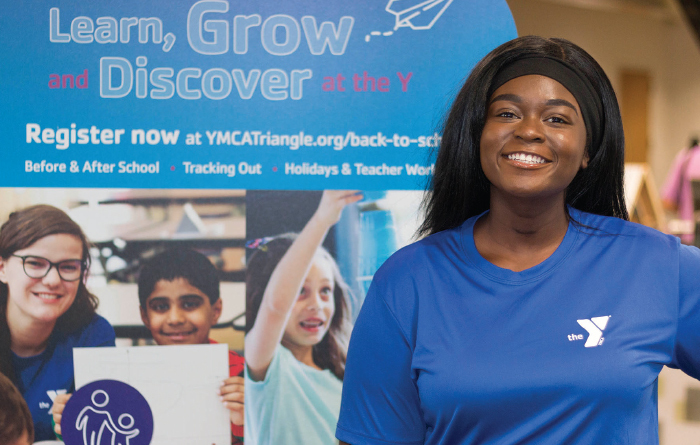 Jennifer Nelson, associate vice president of communications for the YMCA, says the program was developed with Wake County Public Schools, but now reaches far beyond Wake County’s borders. “We want every child to have the opportunity to succeed in the classroom regardless of their ability to pay,” for the Y Learning program, she said. When children are not meeting their benchmarks and fall behind in their studies, teachers can recommend them for the Y Learning program, where they can stay after school with teachers and trained tutors to work on homework, papers and projects. Haddy Badjan was 8 when she began participating in Y Learning. Now in college, she tutors in the program. Proceeds of the SAS Championship go to Y Learning. Photo by Alexa Blazevich. Haddy Badjan was 8 years old when she began participating in the Y Learning program. Four years ago, she decided to return the favor and help kids succeed by becoming a tutor. Now she’s majoring in international studies and Spanish at UNC-Charlotte, with hopes to travel and help provide basic needs for families in the future. She said her favorite part of her YMCA job is watching the kids grow, both academically and as people. The SAS Championship volunteer leadership team with 2016 champion Doug Garwood. It takes about 700 volunteers to put on the event each year. Badjan says some kids would not have the same opportunity to grow if they just went home and watched TV after school. By participating in Y Learning, they are learning self-discipline and strong work ethics. “Watching them grow over the past few years has been phenomenal because they’re great kids. They’re amazing,” she said. 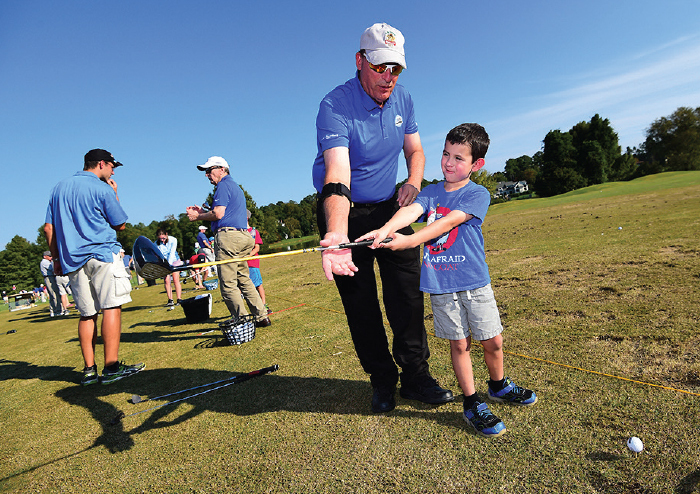 Y Learning serves about 1,100 students each year, thanks to the SAS Championship’s donation. Schaeffer has been volunteering for the SAS Championship since its start in 2001. As the vice chair of volunteers, she says she’s a cheerleader and problem-solver all in one. She leads a team of 350 volunteers who help with admission and sponsorships that make the event possible. 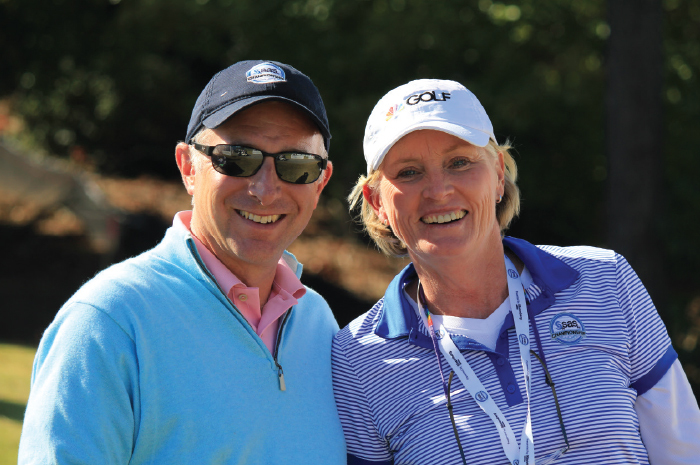 SAS Championship tournament director Jeff Kleiber, left, and vice chair of volunteers Stacey Schaeffer. 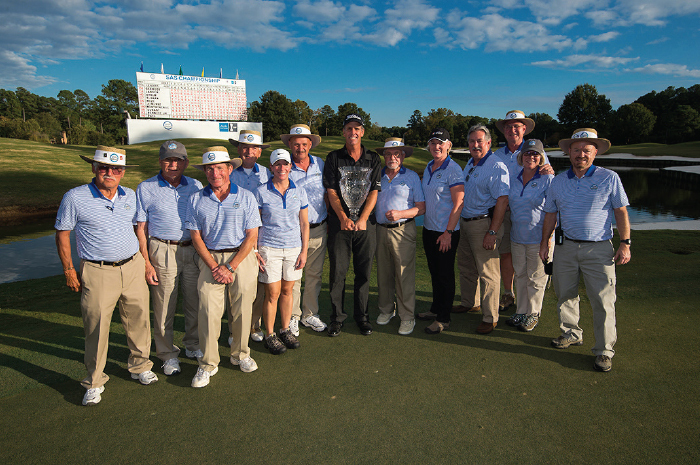 Each year, the SAS Championship requires about 700 volunteers to put on the event. These volunteers range from SAS employees to golf fans to members of the YMCA. 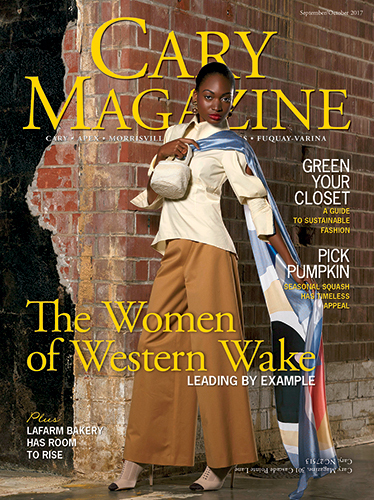 “It is a great corporate citizen in SAS, a great community in Cary, but even more so, it’s the citizens in the area that really come out and support it volunteer-wise, and everybody else that participates in the event by coming out and watching or taking in the other aspects of the week,” Kleiber said. 2017 marks the 17th year of the SAS Championship, an annual charity golf tournament held at Prestonwood Country Club in Cary. This year, the tournament runs from Oct. 9-15, with events spread throughout the week including Food Truck Friday, Executive Women’s Day and a 5k race.